(Nanowerk News) The results of a three-year research project by a University of Huddersfield professor mean that advanced manufacturing companies will have on-line access to a new method of testing the accuracy of their crucial measurement software. 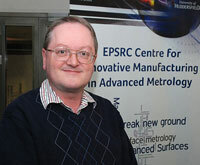 Professor Paul Scott Professor Paul Scott was awarded a Researcher Excellence Grant of 130,000 euros by the EU-funded European Association of National Metrology Institutes (EURAMET) for his part in a major scale project designed to demonstrate that metrology software is fit for purpose. He has now completed his component of the research by developing the mathematical fundamentals for a new system that is due to be put online by the German institute PTB (Physiklisch Technische Bundesanstalt). Manufacturers, software developers and a wide range of researchers in fields where metrology plays an important role will have paid-for access to a webpage that can generate data, which will enable them to assess the accuracy achieved by their current software. They can then make the adjustments required to improve the performance of the software. Professor Scott has provided a detailed account of his research in a paper delivered at the University of Huddersfield, when it hosted the 2015 Laser Metrology, Coordinate Measuring Machine and Machine Tool Performance (LAMDAMAP) conference, a major international event held under the auspices of the European Society for Precision Engineering and Nanotechnology (EUSPEN). His presentation was entitled Fundaments of measurement for testing software in computationally-intensive metrology. Professor Scott described a new mathematical model for measurement and he explored the concept of “measurement as an inverse problem”, which has particular relevance to complex modern measurement instruments such as CT scanners and white light interferometers. Professor Scott is a mathematician who previously worked as a researcher for the firm Taylor Hobson, globally renowned for the design and development of ultra-precision metrology instruments. He applied mathematical ideas and concepts to the development and improvement of measuring instruments, and Professor Scotts’s newly-completed EURAMET research is a further development of his long engagement in the field.s on metals and glasses. The pigments are incorporated in sol-gel nanocomposites and applied by dipping or spraying.